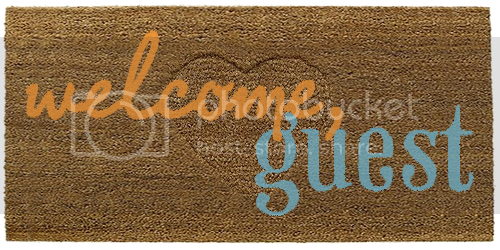 Today's guest post is brought to you by Erin of Robot A Day. (Erin's my amazing partner in crime from the Avengers swap.) Thanks so much for doing this, Erin! These finger hats (it's cold in Canada, we wear these all the time, I promise) came out of the giant behorned helmet hat thing I made for Mandy during our trade. While it was awesome fun to knit, it's large and cumbersome, and I wanted to make something cute. And really, if anything, Mandy's Loki hat is entirely too practical. So I knit a tiny hat to keep your finger warm. 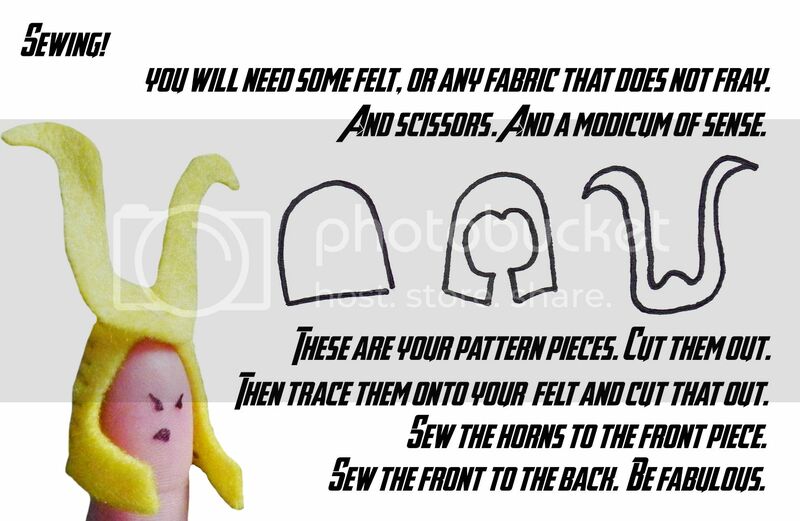 Since not everybody knits, I thought I'd include a version for folks who sew. But then I thought it might be nice to do a version that anyone with a printer and stolen office supplies could make. This is how all of my projects start, an idea that quickly spirals out of control. I'm not going to lie, the idea of doing a Thor helm crossed my mind. Oh BALLS you guys! A Thor helm would mean you could do epic Asgardian thumb wars. And suddenly I know what my next project is. 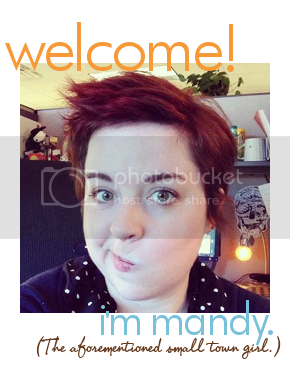 Mandy told me a little about the premise of this post last week and I have to admit I've been looking forward to it quite a bit. 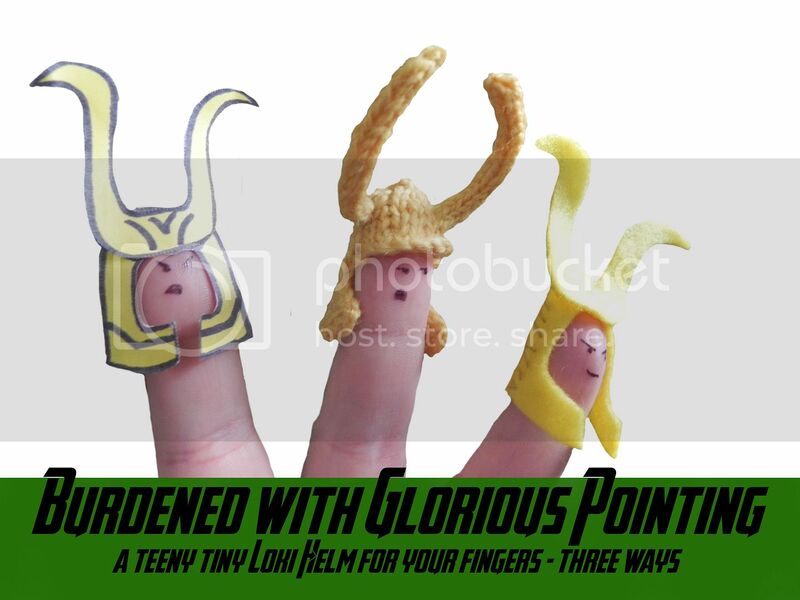 The "Burdened With Glorious Pointing" tagline killed me. 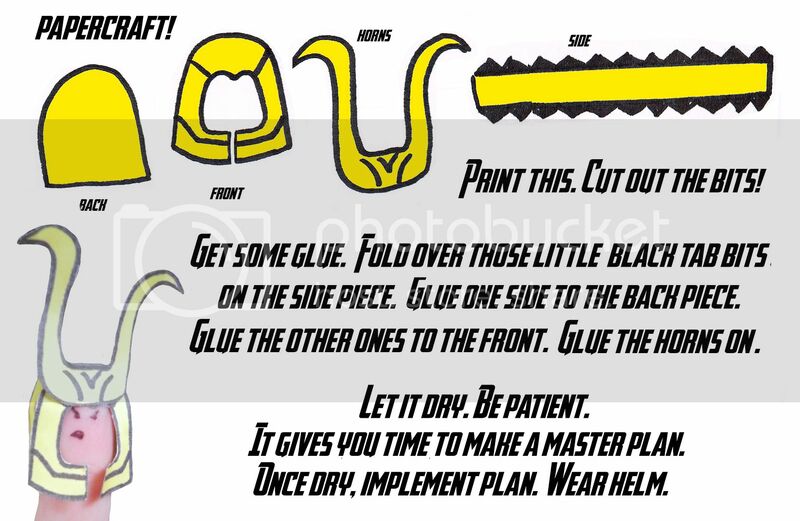 Suddenly I feel like I need a papercraft Loki helm. Aw thanks! I'm glad you love it. And you probably do need a papercraft helm. Got purloined office supplies? You can make it! Loki/Thor thumb wars may be the best idea ever. It is official: I need these finger helms. Absolutely adorable and cute! Especially the knitted version. If anyone makes them, please let me know? I feel a photo round-up post would be necessary.